Sharding is a significant horizontal scalability feature of InterSystems IRIS® Data Platform™. An InterSystems IRIS™ sharded cluster partitions both data storage and caching across a number of servers, providing flexible, inexpensive performance scaling for queries and data ingestion while maximizing infrastructure value through highly efficient resource utilization. Sharding is easily combined with the considerable vertical scaling capabilities of InterSystems IRIS and with horizontal scaling for user volume through the distributed caching architecture, greatly widening the range of solutions available. For a brief introduction to sharding including a hands-on exploration of deploying and using a sharded cluster, see First Look: Scaling for Data Volume with an InterSystems IRIS Sharded Cluster. Queries directed to the shard master are run in parallel on the shard data servers, with the results merged, aggregated, and returned as full query results to the application by the shard master. Because the data partitions, called shards, are hosted by separate instances, each has its own dedicated cache, rather than a single instance’s cache serving the entire data set. Together, the shard master and its associated shard data servers form a sharded cluster. A shard is a subset of a table's rows, with each row contained within exactly one shard, and all shards of a table containing roughly the same number of rows. Each shard data server hosts a data shard, which is comprised of one shard of each sharded table to which the shard master provides access. 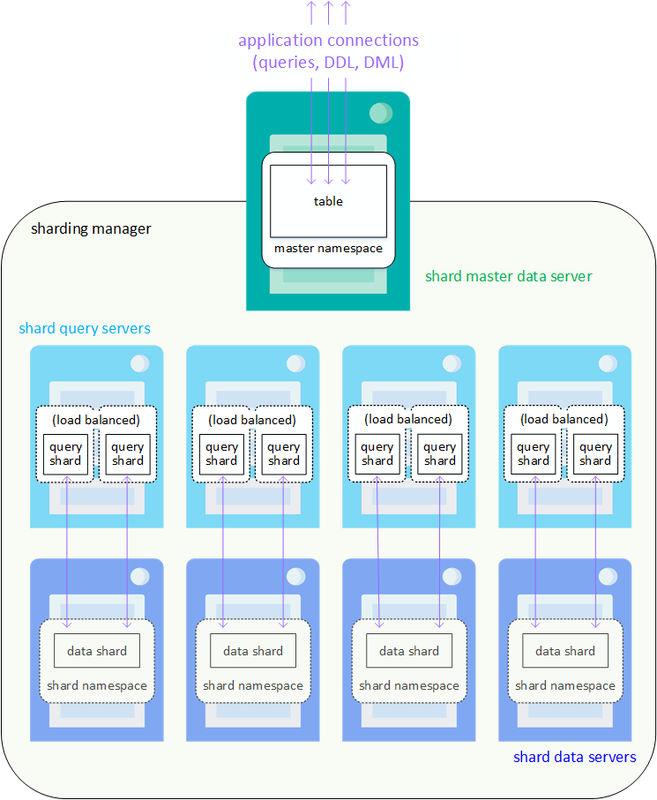 A federated software component called the sharding manager keeps track of which data shards (and therefore which table rows) are located on which shard data servers and directs queries accordingly, as well as managing other sharded operations. From the perspective of the application SQL, the distinction between sharded and nonsharded tables is totally transparent. The shard master provides application access through the master namespace, which contains the sharded tables and in general has all the capabilities of a standard InterSystems IRIS namespace. The master namespace can also contain nonsharded tables, which can be joined to sharded tables in queries. Data shards are contained in shard namespaces assigned to the master namespace; these are managed entirely by the sharding manager and are not exposed to end users. A shard key, composed one or more of the fields in a sharded table, is used to horizontally partition the table across the data shards, providing a deterministic method of distributing data evenly. A shard key can be either a system-assigned ID or a user-defined set of fields. Under this arrangement, any operation that can be performed on the shard master data server  including sharding configuration and sharded data definition and data manipulation  can be performed identically on the shard master app server, and application connections are typically no longer directed to the shard master data server. For this reason, either the shard master data server or shard master app servers can be referred to simply as shard masters. Minimize interference between query and data ingestion workloads. Increase the throughput of a sharded cluster for high volume multiuser workloads. When SQL operations are executed on sharded tables, read-only queries are automatically executed on query shards where they exist, but directly on data shards where they do not. Each query shard is assigned to a single data shard, but a data shard can have multiple query shards assigned to it, in which case queries are automatically load balanced across them. For more information on query shards and adding them to a sharded cluster, see Deploy Query Shards. InterSystems IRIS mirroring, which can be used to provide high availability for both the shard master data server and shard data servers. A mirrored failover pair of InterSystems IRIS instances can be added to a sharded cluster as easily as a single instance. For more information on deploying a mirrored sharded cluster, see Mirror for High Availability. For definitions of the terms used in the preceding and other sharding-related terms, see Sharding Glossary. Sample basic sharded cluster configurations are shown in the following diagrams  first, a basic cluster with four shard data server, and then the same cluster with three shard master application servers added. For an illustration of a sharded cluster with query servers, see Deploy Query Shards. All communication between the nodes of an InterSystems IRIS sharded cluster is managed by the sharding manager. 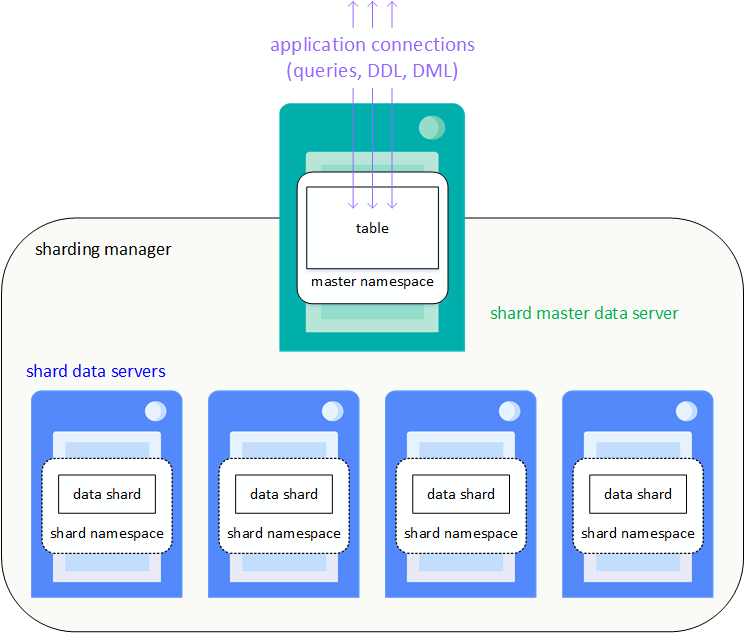 The sharding manager connects the shard master app servers directly to the data shards in the same way as it connects the shard master data server to the data shards. High-volume or high-speed data ingestion, or a combination. Sharding scales data ingestion through the InterSystems IRIS JDBC driver’s use of direct connections to the data shards for parallel loading, distributing ingestion across multiple shard data servers. If the data can be assumed to be validated and uniqueness checking omitted, gains are enhanced. Relatively large data sets, queries that return large amounts of data, or both. Sharding scales caching capacity to match data size by partitioning the cache along with the data, leveraging the memory resources of multiple systems. Each shard data server dedicates its database cache (global buffer pool) to a fraction of the data set, as compared to a single instance’s database cache being available for all of the data. The resulting improvement becomes most evident when the data in regular use is too big to fit in the database cache of a single nonsharded instance. A high volume of complex queries doing large amounts of data processing. Read large amounts of data from persistent storage, and in particular have a high ratio of data retrieved to results returned. A high volume of queries involving joins of tables that can be cosharded  that is, partitioned based on the field or fields on which they are joined, so that rows that are joined are all stored on the same shard. An example of cosharding might be a set of tables in a health care database that are frequently joined to each other on a patient ID field. Cosharded joins are significantly faster than the same queries executed against nonsharded data, so if such queries make up a portion of your overall workload, they can significantly improve performance. Each of these factors on its own influences the potential gain from sharding, but the benefit may be enhanced where they combine. For example, a combination of all three factors  large amounts of data ingested quickly, large data sets, and complex queries that retrieve and process a lot of data  makes many of today’s analytic workloads very good candidates for sharding. 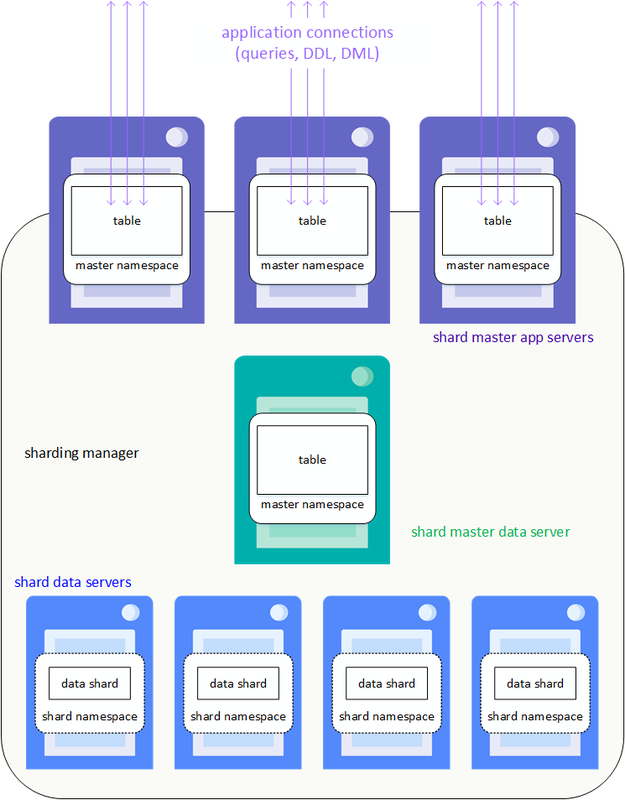 A sharded cluster can be horizontally scaled for high user volume by adding multiple shard master app servers across which application connections are distributed, increasing the cluster’s query throughput. When high data ingestion volume is a performance factor, adding a shard query server to each shard data server increases performance by separating the data ingestion workload from the query processing workload, minimizing interference between the two. In addition, as with multiple shard master app servers, two or more query shards per data shard helps with high multiuser query workloads by increasing the throughput of the shard data servers. As previously noted, and discussed in more detail in Plan an InterSystems IRIS Sharded Cluster, combining InterSystems IRIS sharding with the use of vertical scaling to address some of the factors described in the foregoing may be most beneficial under many circumstances. In the current release, transactions initiated on the shard master do not open corresponding transactions on the shard data servers, and sharding is therefore not appropriate for workloads involving complex transactions requiring atomicity. This section provides procedures for deploying an InterSystems IRIS sharded cluster consisting of a shard master, shard data servers, and optionally shard master application servers. For an important discussion of performance planning, including memory management and scaling, CPU sizing and scaling, and other considerations, see the “Vertical Scaling” chapter of this guide. The recommended method for deploying InterSystems IRIS Data Platform is InterSystems Cloud Manager (ICM). By combining plain text declarative configuration files, a simple command line interface, the widely-used Terraform infrastructure as code tool, and InterSystems IRIS deployment in Docker containers, ICM provides you with a simple, intuitive way to provision cloud or virtual infrastructure and deploy the desired InterSystems IRIS architecture on that infrastructure, along with other services. ICM can deploy sharded clusters and other InterSystems IRIS configurations on Amazon Web Services, Google Cloud Platform, Microsoft Azure or VMware vSphere. ICM can also deploy InterSystems IRIS on an existing physical or virtual cluster. Deploy the Cluster with InterSystems Cloud Manager offers an overview of the process of using ICM to deploy the sharded cluster. For a brief introduction to ICM including a hands-on exploration of deploying a sharded cluster, see First Look: InterSystems Cloud Manager. For complete ICM documentation, see the InterSystems Cloud Manager Guide. You can also manually deploy a sharded cluster using the %SYSTEM.Sharding API or the Management Portal; instructions for this procedure are provided in Deploy the Cluster Using the API or the Management Portal. The most typical sharded cluster configuration involves one InterSystems IRIS instance per system, and one cluster role per instance. When deploying using ICM, this configuration is the only option. The provided procedure for using the Sharding API assumes this configuration as well. InterSystems recommends the use of an LDAP server to implement centralized security across the nodes of a sharded cluster. For information about using LDAP with InterSystems IRIS, see the “Using LDAP” chapter of the Security Administration Guide. How many shard data servers are to be included in the cluster? Are shard master application servers to be included in the cluster and if so, how many? You also need to plan the sizes of the database caches and globals databases on the cluster members. Decide how many shard data server instances to configure. Depending on the anticipated working set of the sharded data you intend to store on the cluster and the nature of the queries you will run against it, as few as four shard data servers or up to sixteen (or possibly more) may be appropriate for your cluster. A good basic method for an initial estimate of the ideal number of shard data servers needed (assuming one data shard per server) for a production configuration, subject to resource limitations, is to calculate the size of the database cache needed on each shard data server for a given number of servers and then determine which combination of number of servers and memory per server is optimal, given your circumstances. This calculation is outlined in the following; see Plan an InterSystems IRIS Sharded Cluster for more detail. Total size of all sharded tables to be stored on the cluster, including their indexes. Total size of the nonsharded tables (including indexes) to be stored on the cluster that will be frequently joined with sharded tables. Total size of all nonsharded tables (including indexes) to be stored on the cluster. Translate these totals into estimated working sets, based on the proportion of the data that is regularly queried. For example, if 40% of the data in the sharded tables is never retrieved by queries, only the 60% that is retrieved and cached is relevant to the total cache size of the shard data servers. Add a safety factor of 50% to each estimate, and call the sizes of the working sets ShardSizeWS, NonshardSizeJoinedWS, and NonshardSizeTotalWS. Bear in mind that while queries joining a nonsharded table and a sharded table count towards the working set NonshardSizeJoinedWS, queries against that same nonsharded data table that do not join it to a sharded table count towards the working set NonshardSizeTotalWS; the same nonsharded data can be returned by both types of queries, and thus would count towards both working sets. NonshardSizeTotalWS is not germane to the shard data servers, but is used in sizing the shard master data server’s database cache; it is included here for consistency with the instructions in Plan an InterSystems IRIS Sharded Cluster. Considering all your options regarding both number of systems and memory per system, configure enough shard data servers so that the database cache (global buffer pool) on each shard data server equals (ShardSizeWS/ShardCount) + NonshardSizeJoinedWS  that is, the shard data server’s share of the working set of sharded data, plus all of the working set of frequently joined nonsharded data. Where more systems with lower memory resources are available, you can add more shard data servers and allocate smaller amounts of memory to the database caches; if memory per system is higher, you can configure fewer servers and allocate more memory to each. Generally speaking and all else being equal, more shards will perform faster due to the added parallelism, up to a point of diminishing returns due to overhead, which typically occurs at around 16 shard data servers. While performance decreases as total cache size decreases, all else being equal, a total shard data server cache size greater than or equal to the sharded working set plus the frequently joined nonsharded working set is the ideal configuration, not a requirement. If you need to add shard data servers after the cluster has been loaded with data, you can automatically redistribute the sharded data across the new servers (although this must be done with the cluster offline); see Rebalance Sharded Data Across Additional Shard Data Servers for more information. On the other hand, you cannot remove a shard data server with sharded data on it, and a server’s sharded data cannot be automatically redistributed to other shard data servers, so reducing the number of shard data servers in a production cluster involves considerably more effort  including dropping all sharded tables before removing the shard data servers, then reloading the data after  than increasing the number of shard data servers. All shard data servers in a sharded cluster should have identical or at least closely comparable specifications and resources; parallel query processing is only as fast as the slowest shard data server. In addition, the configuration of all IRIS instances in the cluster should be consistent; database settings such as collation and those SQL settings configured at instance level (default date format, for example) should be the same on all nodes to ensure correct SQL query results. Standardized procedures and tools like ICM can help ensure this consistency. Decide whether you want to scale for user volume by configuring shard master app servers to distribute application load across multiple instances, and if so how many you will include. You can also do this later using the Sharding APIs after the cluster has been deployed, without reloading data. If shard master app servers are to be deployed, a mechanism to distribute application connections across them is required. ICM can automatically provision and configure load balancers as needed when deploying in a public cloud. Ideally, however, application connections involving similar queries are grouped on the shard master app servers, increasing the benefit of distributed caching. Before beginning the deployment process, you need to know the database cache size to be specified on each member of the sharded cluster. You also need to know the expected size of the data volume needed for the default globals database on the shard master data server and shard data servers. When you deploy a sharded cluster using ICM, these settings are specified by including properties in the configuration files. When you deploy manually using the Sharding API, you specify these settings by hand. Bear in mind that the sizes below are guidelines, not requirements, and that your estimates for these numbers are likely to be adjusted in practice. Shard data servers  The server’s share of the sharded working set plus the total working set of nonsharded data that is frequently joined with sharded data, or (ShardSizeWS / ShardCount) + NonshardSizeJoinedWS according to the calculation described in those sections. Shard master data server and shard master app servers  The working set of all nonsharded data, or NonshardSizeTotalWS as described. As noted in Plan an InterSystems IRIS Sharded Cluster, all instances should have database directories and journal directories located on separate storage devices, if possible, especially when high volume or high speed data ingestion is concurrent with running queries. Shard namespace on shard data servers  Each server’s share of the total size of the sharded data, or ShardSize / ShardCount according to the calculation described in that section, plus a margin for greater than expected growth. When data ingestion performance is a major consideration, consider configuring the initial size of the database to equal the expected maximum size. Master namespace on hard master data server  The total size of nonsharded data, or NonshardSizeTotal as described, plus a margin for greater than expected growth. In a sharded cluster, the master namespace and shard namespaces all share a single default globals database and a single default routines database, physically located on the shard master data server and known as the master globals database and the master routines database. The default globals database created when a shard namespace is created remains on the shard, however, becoming the local globals database, which contains the data stored on the shard. Because the defaults for a shard namespace are not switched to the master databases until the instance is assigned to the cluster as a shard, which comes after the creation of the shard namespace, for clarity, the planning guidelines and instructions in this document refer to the eventual local globals database as the default globals database of the shard namespace. Because the shard master data server and the shard data servers share the master globals database, mappings created in the master namespace are propagated to the data shards. Mappings created on shard master application servers, however, are not propagated. There are several stages involved in provisioning and deploying a containerized InterSystems IRIS configuration, including a sharded cluster, with ICM. The ICM Guide provides complete documentation of ICM, including details of each of the stages. This section briefly reviews the stages and provides links to the ICM Guide. ICM is provided as a Docker image. Everything required by ICM to carry out its provisioning, deployment, and management tasks is included in the ICM container, including a /Samples directory that provides you with samples of the elements required by ICM, customized to the four supported cloud providers. To launch ICM, on a system on which Docker is installed, you use the docker run command with the ICM image from the InterSystems repository to start the ICM container. For detailed information about launching ICM, see Launch ICM in the “Using ICM” chapter of the ICM Guide. Before defining your deployment, you must obtain security-related files including cloud provider credentials and keys for SSH and SSL/TLS. For more information about these files and how to obtain them, see Obtain Security-Related Files in the “Using ICM” chapter. ICM uses JSON files as both input and output. To provide the needed parameters to ICM, you must represent your target configuration and the platform on which it is to be deployed in two of ICM’s JSON configuration files: the defaults.json file, which contains information about the entire deployment, and the definitions.json file, which contains information about the types and numbers of the nodes provisioned and deployed by ICM, as well as details specific to each node type. For example, the defaults file determines which cloud provider your sharded cluster nodes are provisioned on and the locations of the required security files and InterSystems IRIS license keys, while the definitions file determines how many shards are included in the sharded cluster and whether the data volume for the shard master data server will be larger than those for the other nodes. Most ICM parameters have defaults; a limited number of parameters can be specified on the ICM command line as well as in the configuration file. For sample defaults and definitions files for sharded cluster deployment, see Define the Deployment in the “Using ICM” chapter of the ICM Guide. You can create your files by adapting the template defaults.json and definitions.json files provided with ICM in the /Samples directory (for example, /Samples/AWS for AWS deployments), or start with the contents of the samples provided in the documentation.For a complete list of the fields you can include in these files, see ICM Configuration Parameters in the “ICM Reference” chapter of the ICM Guide. The following table briefly lists the types of node (determined by the Role field in the definitions file) that ICM can provision, configure, and deploy services on, with sharded cluster roles highlighted. For detailed descriptions of the node types, see ICM Node Types in the “ICM Reference” chapter of the ICM Guide. ISCglobals  Determines the size of the database cache or caches. For information about possible values, see globals in the Configuration Parameter File Reference. For information about allocating memory to database caches, see Memory and Startup Settings in the “Configuring InterSystems IRIS” chapter of the System Administration Guide. InstanceType  Determines the characteristics of the provisioned cloud node, including memory. The instance type you specify must have sufficient memory to accommodate the database cache you specify using ISCglobals. The larger a cloud instance type or storage volume is, the more it costs. It is therefore advisable to size as accurately as possible, without wasting capacity. In some cases, it may be advisable to increase the size of the generic memory heap on the cluster members, which can be specified in the definitions files using the gmheap property (see General Parameters in the ICM Guide). For information on how to allocate memory to the generic memory heap, see gmheap in the Configuration Parameter File Reference and gmheap in the Advanced Memory Settings section of the Additional Configuration Settings Reference. The values provided for these fields in the sample configuration files that follow are based on arbitrary sizes for the data and working sets involved. What is important is that you determine their values based on your own situation, and include them as needed. In general, appropriate sizing of the compute nodes in a sharded cluster and configuration of the InterSystems IRIS instances on them is a complex matter influenced by many factors, including experience; as your experience accumulates, you are likely to include other InterSystems IRIS configuration parameters in the configuration files. For a complete list of the fields you can include in these files, see ICM Configuration Parameters in the “ICM Reference” chapter of the ICM Guide. All InterSystems IRIS instances in a sharded cluster must have sharding licenses. Once your infrastructure is provisioned, you can use several infrastructure management commands. For detailed information about these and the icm provision command, see Provision the Infrastructure in the “Using ICM” chapter of the ICM Guide. ICM carries out deployment of InterSystems IRIS and other software services using Docker images, which it runs as containers by making calls to Docker. In addition to Docker, ICM also carries out some InterSystems IRIS-specific configuration over JDBC. There are many container management tools available that can be used to extend ICM’s deployment and management capabilities. When deploying InterSystems IRIS images, you must set the password for the predefined accounts on the deployed instances. The simplest way to do this is to omit a password specification from both the definitions files and the command line, which causes ICM to prompt you for the password (with typing masked) when you execute icm run. But this may not be possible in some situations, such as when running ICM commands with a script, in which case you need either the -iscPassword command line option or the iscPassword field in the defaults file. You can deploy different containers on different nodes  for example, InterSystems IRIS the DM and AM nodes and the InterSystems Web Gateway on the WS nodes  by specifying different values for the DockerImage field (such as intersystems/iris:stable and intersystems/webgateway:stable) in the different node definitions in the definitions.json file. To deploy multiple containers on a node or nodes, however, you can run the icm run command more than once  the first time to deploy the image(s) specified by the DockerImage field, and subsequent times using the -image and -container options (and possibly the -role or -machine option) to deploy a custom container. For a full discussion of the use of the icm run command, see The icm run Command in the “Using ICM” chapter of the ICM Guide. In the case of a sharded cluster, the provided link is for the shard master data server instance. Once your containers are deployed, you can use a number of ICM commands to manage the deployed containers and interact with the containers and the InterSystems IRIS instances and other services running inside them; for more information, see Container Management Commands and Service Management Commands in the “Using ICM” chapter of the ICM Guide. For more detailed information about the unprovisioning phase, see Unprovision the Infrastructure in the “Using ICM” chapter of the ICM Guide. Use the following procedure to deploy an InterSystems IRIS sharded cluster consisting of a shard master, shard data servers, and optionally shard master application servers using the %SYSTEM.Sharding API. Instructions are also provided for deploying the cluster using the Sharding Configuration page in the Management Portal (System Administration > Configuration > System Configuration > Sharding Configuration). As with all classes in the %SYSTEM package, the %SYSTEM.Sharding methods are available through $SYSTEM.Sharding. This procedure assumes each InterSystems IRIS instance is installed on its own system. Identify the needed number of networked host systems (physical, virtual, or cloud)  one host each for the shard master, shard data servers, and shard master app servers (if any). A minimum network bandwidth of 1 GB is recommended, but 10 GB or more is preferred, if available; greater network throughput increases the performance of the sharded cluster. Install an instance of InterSystems IRIS on each system, as described in the Installation Guide. All InterSystems IRIS instances in a sharded cluster must be of the same version. Ensure that the storage device hosting each instance’s databases is large enough to accommodate the target globals database size, as described in Plan Database Cache and Database Sizes. All instances should have database directories and journal directories located on separate storage devices, if possible. This is particularly important when high volume data ingestion is concurrent with running queries. For guidelines for file system and storage configuration, including journal storage, see the “File System and Storage Configuration Recommendations” chapter of the Installation Guide and Journaling Best Practices in the Journaling chapter of the Data Integrity Guide. Allocate the database cache (global buffer pool) for each instance, depending on its eventual role in the cluster, according to the sizes you determined in Plan Database Cache and Database Sizes. For the procedure for allocating the database cache, see Memory and Startup Settings in the Configuring InterSystems IRIS chapter of the System Administration Guide. In some cases, it may be advisable to increase the size of the generic memory heap on the cluster members. For information on how to allocate memory to the generic memory heap, see gmheap in the Configuration Parameter File Reference and gmheap in the Advanced Memory Settings section of the Additional Configuration Settings Reference. For guidelines for allocating memory to an InterSystems IRIS instance’s routine and database caches as well as the generic memory heap, see Calculating Initial Memory Requirements in the “Vertical Scaling” chapter. Perform the following steps on the instances with each role in the cluster. Create a new database for the default globals database, making sure that it is located on a device with sufficient free space to accommodate its target size, as described in Plan Database Cache and Database Sizes. If data ingestion performance is a significant consideration, set the initial size of the database to its target size. Select the globals database you created for the namespace’s default routines database. As noted in the Plan Database Cache and Database Sizes, the shard master data server and shard data servers all share a single default globals database physically located on the shard master and known as the master globals database. The default globals database created when a shard namespace is created remains on the shard, however, becoming the local globals database, which contains the data stored on the shard. Because the shard data server does not start using the master globals database until assigned to the cluster, for clarity, the planning guidelines and instructions in this document refer to the eventual local globals database as the default globals database of the shard namespace. A new namespace is automatically created with IRISTEMP configured as the temporary storage database; do not change this setting for the shard namespace. For a later step, record the DNS name or IP address of the host system, the superserver (TCP) port of the instance, and the name of the shard namespace you created. To see or set the instance’s superserver port number, select System Administration > Configuration > System Configuration > Memory and Startup in the management portal. Create the shard namespace by following the instructions in step 1, and make sure you have recorded the needed information about the instance as detailed in step 2. Navigate to the Sharding Configuration page (System Administration > Configuration > System Configuration > Sharding Configuration) and use the Enable Sharding button to enable sharding, then restart the instance. Ensure that the default globals database you create is located on a device with sufficient free space to accommodate its target size, as described in Plan Database Cache and Database Sizes. If data ingestion performance is a significant consideration, set the initial size of the database to its target size. A new namespace is automatically created with IRISTEMP configured as the temporary storage database; do not change this setting for the master namespace. Because the intermediate results of sharded queries are stored in IRISTEMP, this database should be located on the fastest available storage with significant free space for expansion, particularly if you anticipate many concurrent sharded queries with large result sets. The $SYSTEM.Sharding.VerifyShards() call identifies a number of errors. For example, if the port provided in a $SYSTEM.Sharding.AssignShard() call is a port that is open on the shard data server host but not the superserver port for an InterSystems IRIS instance, the shard is not correctly assigned; the $SYSTEM.Sharding.VerifyShards() call indicates this. After configuring shard master application servers as described in the next section, you can call $SYSTEM.Sharding.VerifyShards() on each of them as well to confirm that they can communicate with the shard master data server and the shards. Create the master namespace by following the instructions in step 1. Click the Assign Shard button and enter the shard data server’s host, the instance’s superserver port, and the name of the shard namespace in the Assign Shard dialog. Leave the drop-down set to Data Shard, and leave the Mirrored checkbox cleared. Click Finish to assign the shard data server to the cluster. Click the Verify Shards button to verify that the shards have been correctly configured and that the shard master can communicate with them. If the operation reports an error, you can use the Edit link to review and if necessary correct the information you entered, or the Deassign link to deassign the shard data server and repeat the Assign Shard operation. If you have many shard data servers to assign, you can make the verification operation automatic by clicking the Advanced Settings button and selecting the Automatically verify shards on assignment in the Advanced Settings dialog. Other settings in this dialog should be left at the defaults when you deploy a sharded cluster. Add the shard master data server as a data server. Do not change the Maximum number of data servers and Maximum number of application servers settings on the ECP Settings page, which were specified by the $SYSTEM.Sharding.EnableSharding() call. Create a namespace on the shard master data server and configure the default globals and routines databases of the master namespace on the shard master data server as the default globals and routines databases of the namespace on the shard master app server, thereby adding them as remote databases. This will be the namespace in which to execute queries, rather than the master namespace on the shard master data server. If you have configured shard master app servers, configure the desired mechanism to distribute application connections across them. Add the shard master data server as a data server, create a namespace, and configure the master namespace’s globals and routines databases as the databases for the new namespace, as described in step 2. Overall size  All other things being equal, the larger the table, the greater the potential gain. Data ingestion  Does the table receive frequent and/or large INSERT statements? Parallel data loading means sharding can improve their performance. Query volume  Which tables are queried most frequently on an ongoing basis? Again, all other things being equal, the higher the query volume, the greater the potential performance improvement. Query type  Among the larger tables with higher query volume, those that frequently receive queries that read a lot of data (especially with a high ratio of data read to results returned) or do a lot of computing work are excellent candidates for sharding. For example, is the table frequently scanned by SELECT statements? Does it receive many queries involving aggregate functions? As discussed in Choose a Shard Key, tables that are frequently joined can be sharded with equivalent shard keys to enable cosharded joins, so that joining can be performed locally on individual shards, enhancing performance. Review each frequently-used query that joins two large tables to evaluate whether it represents an opportunity for a cosharded join. If (and only if) the queries that would benefit from cosharding the tables represent a sizeable portion of your overall query workload, these joined tables are good candidates for sharding. However, when a large table is frequently joined to a much smaller one, sharding the large one and making the small one nonsharded may be most effective. Careful analysis of the frequency and query context of particular joins can be very helpful in choosing which tables to shard. A unique constraint on a sharded table can have a significant negative impact on insert/update performance unless the shard key is a subset of the unique key; see Choose a Shard Key for more information. The distinction between sharded and nonsharded tables is totally transparent to the application SQL. Like index selection, sharding decisions have implications for performance only. Regardless of other factors, tables that are involved in complex transactions requiring atomicity should never be sharded. Sharded tables are created only in the master namespace on the shard master data server, using a SQL CREATE TABLE statement containing a sharding specification. This specification indicates that the table is to be sharded, and determines the shard key  the field or fields used to determine which rows of a sharded table are stored on which shards. By default, the RowID is used as the shard key, but you can optionally specify a user-defined shard key. Once the table is created with the appropriate shard key, you can load data into it using INSERT and dedicated tools. By default, data is loaded into a sharded table using the RowID as the shard key. This is the most effective approach for almost all sharded tables, because it offers the best guarantee of an even distribution of data and allows the most efficient parallel data loading. There is one case, however, in which another approach may be beneficial: that in which you will be frequently joining two large sharded tables in your queries. To address this situation, you can enable cosharded joins by specifying the same shard key for two or more tables. A sharded query is decomposed into shard-local queries, each of which is run independently and locally on its shard and needs to see only the data that resides on that shard. When the sharded query involves one or more joins, however, the shard-local queries need to see data from other shards, which requires more processing time and uses more of the memory allocated to the database cache. But in a cosharded join, a row is guaranteed to join only with rows that reside on the same shard, so shard-local queries can run independently and locally. If joins will involve multiple fields, tables can be sharded on equivalent multiple field shard keys. When this has been done, all of the fields in the key must be specified as equal predicates in the join in order for the query to be cosharded. Like queries with no joins, cosharded joins scale well with increasing numbers of shards, and they also scale well with increasing numbers of joined tables. Joins that are not cosharded perform well with moderate numbers of shards and joined tables, but scale less well with increasing numbers of either. For these reasons, you should carefully consider cosharded joins at this stage, just as, for example, indexing is taken into account to improve performance for frequently-queried sets of fields. Bear in mind that by sharding a table using a field or fields as the shard key, you are enabling cosharded joins for other tables that can be sharded using that field, but ruling out cosharded joins with other sharded tables that do not share that field. The shard key of a sharded table cannot be changed, and its values cannot be updated. When a sharded table has a unique constraint, uniqueness is guaranteed across all shards. Generally, this means uniqueness must be enforced across all shards for each row inserted or updated, which substantially slows insert/update performance. When the shard key is a subset of the fields of the unique key, however, uniqueness can be guaranteed across all shards by enforcing it locally on the shard on which a row is inserted or updated, which avoids this performance impact. For example, if you shard the DEPARTMENT and EMPLOYEE tables on the deptnum field to create a cosharded join between these tables, as described in the foregoing, a unique constraint on the empnum field of the EMPLOYEE table requires cross-shard enforcement and thus slows insert/update performance, whereas a unique constraint on the deptnum field of the EMPLOYEE table can be enforced locally and thus has no such impact. The unique constraint is removed before sharding. The shard key defined is a subset of the unique key. Insert and update performance is considered much less important than query performance for the table in question. The empty target sharded table is created using a standard CREATE TABLE statement (see CREATE TABLE in the SQL Reference) in the sharded namespace on the shard master. A sharding specification added to the statement indicates that the table is to be sharded and provides the shard key; it consists of the term shard, which indicates a sharded table with sharding on the ID key by default, and an optional shard key specification containing one or more fields. While the preceding statements are an example of a common cosharded join scenario, in which the shard key is the primary key on one side of the join, cosharding also works for many-to-many joins; the shard key is not required to be the primary key (or any other kind of key) on either side. If the PK_IS_IDKEY option is set when you create a table, as described in Defining the Primary Key in the Create Table entry in the SQL Reference, the table’s RowID is the primary key; in such a case, omitting the shard key specification from the CREATE TABLE statement sets the primary key as the shard key. The best practice, however, if you want to use the primary key as the shard key is to explicitly specify the shard key, so that there is no need to determine the state of this setting before creating tables. You can display a list of all of the sharded tables on a cluster, including their names, owners, and shard keys, by navigating to the Sharding Configuration page of the Management Portal (System Administration > Configuration > System Configuration > Sharding Configuration) on the shard master data server or a shard data server, selecting the namespace that belongs to the cluster (master namespace on the shard master or shard namespace on a data shard), and selecting the Sharded Tables tab. For a table you have loaded with data, you can click the Details link to see how many of the table’s rows are stored on each shard data server in the cluster. You cannot use ALTER TABLE to make an existing nonsharded table into a sharded table (you can however use ALTER TABLE to alter a sharded table). The SHARD KEY fields must be of numeric or string data types. The only collations currently supported for shard key fields are exact, SQLString, and SQLUpper, with no truncation. All data types are supported except stream fields, the ROWVERSION field, and SERIAL (%Counter) fields. A sharded table cannot include %CLASSPARAMETER VERSIONPROPERTY. For further details on these items, see CREATE TABLE in the InterSystems SQL Reference. Data can be loaded into sharded tables by using INSERT statements through any InterSystems IRIS interface that supports SQL, for example the management portal, the Terminal, or JDBC. Rapid bulk loading of data into sharded tables is supported by the transparent parallel load capability built into the InterSystems IRIS JDBC driver, as well as by the InterSystems IRIS Connector for Spark (see Deploy and Manage Services), which leverages the same capability. Java-based applications also transparently benefit from the InterSystems IRIS JDBC driver’s parallel loading capability. You can verify that a sharded table was created as intended by loading data using an INSERT or INSERT SELECT FROM through any InterSystems IRIS interface that supports SQL and then querying the table or tables in question. The InterSystems IRIS Spark Connector allows you to add Apache Spark capabilities to a sharded cluster. The recommended configuration is to locate Spark slaves on the shard data server hosts and a Spark master on the shard master data server host, connected to the corresponding InterSystems IRIS instances. When you deploy a sharded cluster using ICM, the Apache Spark image provided by InterSystems lets you easily and conveniently create this configuration (see The icm run Command in the “Using ICM” chapter of the ICM Guide). For more information about the Spark Connector and using it to load data, see Using the InterSystems IRIS Spark Connector. Any database for which a suitable JDBC driver is available can act as the data source. For most data loading operations, including simple INSERTs, the JDBC driver uses direct connections to the data shards brokered by the shard master. This requires the driver client to reach the shard data servers at the IP addresses or hostnames with which they were assigned to the master namespace (see Configure the Shard Master Data Server), and means you cannot execute such queries if this is not possible. For example, when connecting from a local client to a sharded cluster provisioned in the cloud by ICM, the shard data server IP addresses known to and returned by the shard master will be on the cloud subnet and thus inaccessible from the local machine. For your convenience, InterSystems provides Simple Data Transfer, a JDBC-based utility that can be used to load large amounts of data from a JDBC data source or flat CSV file into both sharded tables and nonsharded tables (in both sharded and nonsharded namespaces). For more information about Simple Data Transfer, see the “Using the Simple Data Transfer Utility” chapter of Using Java JDBC with InterSystems IRIS. You can create nonsharded tables in the master namespace on the shard master data server, and load data into them, using your customary methods. These tables are immediately available to the cluster for both nonsharded queries and sharded queries that join them to sharded tables. (This is in contrast to architectures in which nonsharded tables must be explicitly replicated to each node that may need them.) See Evaluate Existing Tables for Sharding for guidance in choosing which tables to load as nonsharded. The master namespace and the sharded tables it contains are fully transparent, and SQL queries involving any mix of sharded and nonsharded tables in the master namespace, or the corresponding namespace on a shard master app server, are no different from any SQL queries against any tables in an InterSystems IRIS namespace. No special query syntax is required to identify sharded tables or shard keys. Queries can join multiple sharded tables, as well as sharded and nonsharded tables. Everything is supported except what is specified in the following, which represent limitations and restrictions in the initial version of the InterSystems IRIS sharded cluster; the goal is that they will all be removed. Sharded tables can be accessed using SQL only. Access through the object API and at the globals level is not currently supported. The only referential integrity constraints that are enforced for sharded tables are foreign keys when the two tables are cosharded, and the only referential action supported is NO ACTION. Shard key fields must be of numeric or string data types. The only collations currently supported for shard key fields are exact, SQLString, and SQLUpper, with no truncation. Row-level security for sharded tables is not currently supported. Linked tables sourcing their content through a SQL Gateway connection cannot be sharded. Queries on sharded tables cannot involve implicit joins (also known as arrow syntax) on either the primary or the referenced table in the current version. Queries with stream fields in the SELECT list are not currently supported. Aggregate function extensions including %FOREACH, and %AFTERHAVING. Queries with both a nonaggregated field and an aggregate function, unless the GROUP BY clause is used. The FOR SOME %ELEMENT predicate condition. If you want to explicitly purge cached queries on the shard data servers, you can either purge all cached queries from the master namespace, or purge cached queries for a specific table. Both of these actions propagate the purge to the shard data servers. Purging of individual cached queries is never propagated to the shard data servers. For more information about purging cached queries, see Purging Cached Queries in the “Cached Queries” chapter of the SQL Optimization Guide. For further assistance in evaluating the benefits of these options for your cluster, please contact the InterSystems Worldwide Response Center (WRC). As described in Plan an InterSystems IRIS Sharded Cluster, the number of shard data servers you include in a cluster when first deployed is influenced by a number of factors, including but not limited to the estimated working set for sharded tables and the compute resources you have available. Over time, you may want to increase the number of shard data servers because the size of your sharded data may grow significantly enough to make a higher shard count desirable, for example, or because a resource constraint has been removed. Shard data servers can be added using the Sharding API by repeating the steps outlined in Configure the Shard Data Servers; a future release will provide the ability to add shard data servers to an ICM-deployed cluster using ICM. Existing rows of all existing sharded tables remain (roughly) evenly distributed across the original set of shard data servers. The rows of new sharded tables are evenly distributed across all of the shard servers. Rows added to existing sharded tables with system-assigned shard keys are evenly distributed across all of the shard servers. Rows added to existing sharded tables with user-defined shard keys are evenly distributed across the original set of shard servers. You can, however, use the $SYSTEM.Sharding.Rebalance() API call to rebalance existing sharded data across the expanded set of shard data servers. For example, if you go from four shard data servers to eight, rebalancing takes you from four existing shard data servers with one fourth of the sharded data on each, plus four empty new servers, to eight servers with one eighth of the data on each. Rebalancing also allows rows added to existing sharded tables with user-defined shard keys to be evenly distributed across all of the shard servers. Thus, after you rebalance, all sharded data  including existing tables, rows added to existing tables, and new tables  is evenly distributed across all shard servers. At this release, a new sharded table cannot be cosharded with a table created when the cluster had a different number of shard data servers. This is true regardless of whether data is rebalanced after shard data servers are added. For this reason, when a cluster’s schema is still under development, the addition of shard data servers should be approached with caution. This limtation will be removed in the next maintenance release. Rebalancing cannot coincide with queries and updates, and so can take place only when the sharded cluster is offline and no other sharded operations are possible. (In a future release, this limitation will be removed.) For this reason, the $SYSTEM.Sharding.Rebalance() call places the sharded cluster in a state in which queries and updates of sharded tables are not permitted to execute, and return an error if attempted. Each rebalancing call can specify a time limit, however, so that the call can be scheduled in a maintenance window, move as much data as possible within the window, and return the sharded cluster to a fully-usable state before the window ends. By using this approach with repeated calls, you can fully rebalance the cluster over a series of scheduled maintenance outages without otherwise interfering with its operation. You can also specify the minimum amount of data to be moved by the call; if it is not possible to move that much data within the specified time limit, no rebalancing occurs. Query and update operations execute correctly before rebalancing is performed (when new shard servers are still empty), in between the calls of a multicall rebalancing operation, and after rebalancing is complete, but they are most efficient after all of the data has been rebalanced across all of the shard servers. The illustration that follows show the process of adding shards and rebalancing data using a multicall rebalancing operation. An InterSystems IRIS mirror is a logical grouping of physically independent InterSystems IRIS instances simultaneously maintaining exact copies of production databases, so that if the instance providing access to the databases becomes unavailable, another can take over. A mirror can provide high availability through automatic failover, in which a failure of the InterSystems IRIS instance providing database access (or its host system) causes another instance to take over automatically and immediately. The Mirroring chapter of the High Availability Guide contains detailed information about InterSystems IRIS mirroring. Both the shard master data server and the shard data servers in a sharded cluster can be mirrored; the recommended general best practice is that either all of these nodes are mirrored, or that none are. Note that when data shards are mirrored, sharded queries can transparently complete successfully even if one or more shards fail over during query execution. Because they do not store persistent data, shard master app servers and shard query servers never require mirroring. This release does not support the use of async members in mirrors serving as shard master data server or shard data server nodes in sharded clusters. Add Mirror: True to the defaults file. Define two DM nodes in the definitions file. For more information on deploying mirrored configurations with ICM, see ICM Cluster Topology and Mirroring in the “ICM Reference” chapter of the ICM Guide. After determining how many shard data servers you want, install InterSystems IRIS on twice that number of nodes, plus two more for the mirrored shard master data server, as described in Install InterSystems IRIS on the Cluster Nodes. Configure each pair of shard data servers and the pair of shard master data servers as the failover members of a mirror, as described in Creating a Mirror in the “Mirroring” chapter of the High Availability Guide. Configure the primary as described in Configure the Shard Data Servers and Configure the Shard Master Data Server, ensuring that when you create the shard namespaces and master namespace, you create the default globals database of each namespace as a mirrored database in the mirror, and including the $SYSTEM.Sharding.EnableSharding() call on all primary nodes and the $SYSTEM.Sharding.AssignShard(), $SYSTEM.Sharding.ListShards(), and $SYSTEM.Sharding.VerifyShards() calls on the shard master data server primary. Configure the backup as described in the same sections, choosing the mirrored database you created on the primary as the default globals database for the shard or master namespace on the backup, including the $SYSTEM.Sharding.EnableSharding() call, and omitting the $SYSTEM.Sharding.AssignShard() and the calls that follow  that is, calling only $SYSTEM.Sharding.EnableSharding()  on the shard master data server backup. Increase the throughput of a sharded cluster for high volume multiuser query workloads. When SQL operations are executed on sharded tables, read-only queries are automatically executed on the query shards for all data shards that have them assigned, but directly on data shards that have no query shards assigned. All write operations (insert, update, delete, and DDL operations) are always automatically executed directly on data shards, regardless of the presence of query shards. If a query shard or the shard server hosting it fails, queries are automatically directed to other query shards assigned to that data shard; if there are no other query shards, queries are executed directly on the data shard. The following diagram illustrates a sharded cluster with query shards. See Plan Shard Query Servers for information about circumstances under which query servers are beneficial and guidelines for planning their configuration within the cluster. To include shard query servers in the sharded cluster when deploying using InterSystems Cloud Manager (ICM), include the desired number of QS nodes in the definitions file (see Define the Deployment). Query shards are assigned to data shards in round robin fashion; to follow the recommendation for the same number of query shards per data shard, define the same number of QS nodes as DS nodes, or twice as many, or three times as many, and so on. On the shard query server, follow the procedure described for data shard servers in Configure the Shard Servers. Choose any database for the default globals and routines databases of the shard namespace; on a shard query server, this is not significant. where the argument is the name of the master namespace. With a given number of systems hosting shard data servers, configuring multiple shard data server instances per system, using the Sharding API, can significantly increase data ingestion throughput. Therefore, when achieving the highest data ingestion throughput at the lowest cost is a concern, this may be achieved by installing more shard server instances than there are hosts, with each system hosting two or three shard servers. The gain achieved will depend on server type, server resources, and overall workload. While adding to the total number of systems might achieve the same throughput gain, or more (without dividing a host system’s memory among multiple database caches), adding instances is less expensive than adding systems. This section provides some first-order guidelines for planning a basic sharded cluster, and for adding shard query servers and shard master app servers. It is not intended to represent detailed instructions for a full-fledged design and planning process. Scale vertically to make each system and instance as powerful as feasible, then scale horizontally by adding additional powerful nodes. Scale horizontally using multiple affordable but less powerful systems as a cost-effective alternative to one high-end, heavily-configured system. In practice, in most situations, a combination of these approaches works best. Unlike other horizontal scaling approaches, InterSystems IRIS sharding is easily combined with InterSystems IRIS’s considerable vertical scaling capacities. In many cases, a cluster hosted on reasonably high-capacity systems with a range of from 4 to 16 shard servers will yield the greatest benefit. To use these guidelines, you need to estimate several variables related to the amount of data to be stored on the cluster. Total size of all the sharded tables to be stored on the cluster, including their indexes. Total size of the nonsharded tables (including indexes) to be stored on the cluster. Translate these totals into estimated working sets, based on the proportion of the data that is regularly queried. For significant the SELECT statements frequently made against the table, examine the WHERE clauses. Do they typically look at a subset of the data that you might be able to estimate the size of based on table and column statistics? Do the subsets retrieved by different SELECT statements overlap with each other or are they additive? Review significant INSERT statements for size and frequency. It may be more difficult to translate these into working set, but as a simplified approach, you might estimate the average hourly ingestion rate in MB (records per second * average record size * 3600) and add that to the working set for the table. Consider any other frequent queries for which you may be able to specifically estimate results returned. Bear in mind that while queries joining a nonsharded table and a sharded table count towards the working set NonshardSizeJoinedWS, queries against that same nonsharded data table do not join it to a sharded table count towards the working set NonshardSizeTotalWS, which means that the same nonsharded data can be returned by both types of queries, and thus would count towards both working sets. You can then add these estimates together to form a single estimate for the working set of each table, and add those estimates to roughly calculate the overall working sets. These overall estimates are likely to be fairly rough and may turn out to need adjustment in production. Add a safety factor of 50% to each estimate. The provided guidelines represent the most advantageous configuration, rather than the minimum requirement. For example, as noted in Evaluating the Benefits of Sharding, sharding improves performance in part by caching data across multiple systems, rather than all data being cached by a single nonsharded instance, and the gain is greatest when the data in regular use is too big to fit in the database cache of a nonsharded instance. Ideally, as indicated in the guidelines, the collective database caches of all the shard server instances in a cluster would equal at least the total size of the sharded data and frequently joined nonsharded data, and performance decreases as total cache size decreases (all else being equal). But as long as the total shard server cache size is greater than or equal to the cache size of that single nonsharded instance, the sharded cluster will outperform the nonsharded instance. Bear in mind that these are guidelines, not absolute requirements. For example, if it is not possible to allocate database cache memory on the shard servers equal to what is recommended, get as close as you can. Furthermore, your initial estimates may turn out to need adjustment in practice. Database cache refers to the database cache (global buffer pool) memory allocation that must be made for each instance, as described in Memory and Startup Settings in the Configuring InterSystems IRIS chapter of the System Administration Guide. For guidelines for allocating memory to an InterSystems IRIS instance’s routine and database caches as well as the generic memory heap, see Calculating Initial Memory Requirements in the “Vertical Scaling” chapter. Default globals database indicates the target size of the database in question, which is the maximum expected size plus a margin for greater than expected growth. The file system hosting the database should be able to accommodate this total, with an extra margin there as well. For general information about InterSystems IRIS database size and expansion and the management of free space relative to InterSystems IRIS databases, see Configuring Databases in the Configuring InterSystems IRIS chapter and Maintaining Local Databases in the Managing InterSystems IRIS chapter of the System Administration Guide. As noted in the Plan Database Cache and Database Sizes, the shard master data server and shard data servers all share a single default globals database physically located on the shard master and known as the master globals database. The default globals database created when a shard data server is configured remains on the shard, however, becoming the local globals database, which contains the data stored on the shard. Because the shard data server does not start using the master globals database until assigned to the cluster, however, for clarity, the planning guidelines and instructions in this document refer to the eventual local globals database as the default globals database on the shard data server. All instances should have database directories and journal directories located on separate storage devices, if possible. This is particularly important when high volume data ingestion is concurrent with running queries. For guidelines for file system and storage configuration, including journal storage, see the File System and Storage Configuration Recommendations chapter of the Installation Guide and Journaling Best Practices in the Journaling chapter of the Data Integrity Guide. The number of shard data servers (ShardCount) and the database cache size on each shard server are both variables. The desired relationship between the sum of the shard data servers’ database cache sizes and the total working set estimates can be created by varying the number of shards and the database cache size per shard server. This choice can be based on factors such as cost tradeoffs between system costs and memory costs; where more systems with lower memory resources are available, you can allocate smaller amounts of memory to the database caches, and when memory per system is higher, you can configure fewer servers. Generally speaking and all else being equal, more shards will perform faster due to the added parallelism, up to a point of diminishing returns. The most favorable configuration is typically in the 4-16 shard range, so other factors aside, for example, 8 shard data servers with M memory each may perform better than 64 shards with M/8 memory each. Bear in mind that if you need to add shard data servers after the cluster has been loaded with data, you can automatically redistribute the sharded data across the new servers (although this must be done with the cluster offline); see Rebalance Sharded Data Across Additional Shard Data Servers for more information. On the other hand, you cannot remove a shard data server with sharded data on it, and a server’s sharded data cannot be automatically redistributed to other shard data servers, so reducing the number of shard data servers in a production cluster involves considerably more effort  including dropping all sharded tables before removing the shard data servers, then reloading the data after  than increasing the number of shard data servers. Whatever the number of shard data servers, the best practice is to size and configure them all identically, as query performance is gated by the slowest shard. When data ingestion performance is a major consideration, consider configuring initial size of the database (see Configuring Databases) to equal the expected maximum size. This database should have the same characteristics, such as locale and collations, on all shard data servers. No specific recommendation, but ensure that the database is located on the fastest possible storage, with space for significant expansion. No specific recommendations. All InterSystems IRIS servers can benefit by greater numbers of CPUs, whether or not sharding is involved. Vertical scaling of CPU, memory, and storage resources can always be used in conjunction with sharding to provide additional benefit, but is not specifically required, and is governed by the usual cost/performance tradeoffs. Each shard master application server should ideally have the same database cache size as that recommended for the shard master data server (see Plan a Basic Cluster of Shard Master Data Server and Shard Data Servers). The IRISTEMP database should be located on a fast storage device that provides space for significant expansion. There are no requirements regarding the master namespace’s default globals database, because the default globals database of the master namespace on the shard master data server will be added as a remote database and configured as the default globals database for the master namespace on the shard master app servers (see Configure the Shard Master App Servers for Sharding API steps; ICM configures this automatically). High volume data ingestion concurrent with high query volume. Use of query shards minimizes interference and contention between ingestion and queries. One shard query server per data shard server is sufficient to accomplish this. Increasing the number of query shards per data shard increases the overall throughput for queries from multiple users and applications, in just the same way that load balancing across multiple application servers or shard master app servers increases throughput for applications running against data on the underlying data server. Adding more query shards per data shard does not increase the degree of partitioning or parallelism for individual queries, but it permits multiple sharded queries to run in parallel against the data on each underlying data shard. Thus, it increases overall throughput, but does not improve the response time for individual queries, if only one query is run at a time; this is why it is not beneficial unless multiuser query workloads are involved. The best practice is to assign the same number of query shards to each data shard. Follow the shard data server recommendations (see Plan a Basic Cluster of Shard Master Data Server and Shard Data Servers) for shard query server database cache size; each shard query server should ideally have the same size database cache as the shard data server to which it is assigned. There are no requirements regarding the shard namespace’s default globals database. When deployed, the default globals database of the shard namespace on the shard data server is added as a remote database and configured as the default globals database for the shard namespace on the shard query server (see Deploy Query Shards). When data is distributed across multiple systems, as in an InterSystems IRIS sharded cluster, backup and restore procedures may involve additional complexity. Where strict consistency of the data across a sharded cluster is required, independently backing up and restoring individual nodes is insufficient, because the backups may not all be created at the same logical point in time. This makes it impossible to be certain, when the entire cluser is restored following a failure, that ordering is preserved and the logical integrity of the restored databases is thereby ensured. For example, suppose update A of data on shard data server S1 was committed before update B of data on shard data server S2. Following a restore of the cluster from backup, logical integrity requires that if update B is visible, update A must be visible as well. But if backups of S1 and S2 are taken independently, it is impossible to guarantee that the backup of S1 was made after A was committed, even if the backup of S2 was made after B was committed, so restoring the backups independently could lead to S1 and S2 being inconsistent with each other. If, on the other hand, the procedures used coordinate either backup or restore and can therefore guarantee that all systems are restored to the same logical point in time  in this case, following update B  ordering is preserved and the logical integrity that depends on it is ensured. This is the goal of coordinated backup and restore procedures. To greatly reduce the chances of having to use any of the procedures described here to restore your sharded cluster, you can deploy it with mirrored data servers, as described in Mirror for High Availability. Even if the cluster is unmirrored, most data errors (data corruption, for example, or accidental deletion of data) can be remedied by restoring the data server on which the error occurred from the latest backup and then recovering it to the current logical point in time using its journal files. The procedures described here are for use in much rarer situations requiring a cluster-wide restore. Coordinated backup and restore of a sharded cluster always involves all of the data servers in the cluster  that is, the shard master data server and the shard data servers. The InterSystems IRIS Backup API includes a Backup.ShardedCluster class that supports three approaches to coordinated backup and restore of a sharded cluster’s data servers. To understand how these approaches work, it is important that you understand the basics of InterSystems IRIS data integrity and crash recovery, which are discussed in the “Introduction to Data Integrity” chapter of the Data Integrity Guide. Database journaling, a critical feature of data integrity and recovery, is particularly significant for this topic. Journaling records all updates made to an instance’s databases in journal files. This makes it possible to recover updates made between the time a backup was taken and the moment of failure (or another selected point) by restoring updates from the journal files following restore from backup. Journal files are also used to ensure transactional integrity by rolling back transactions that were left open by the failure. For detailed information about journaling, see the “Journaling” chapter of the Data Integrity Guide. The degree to which activity is interrupted by the backup procedure. The complexity of the required restore procedure. The frequency with which the backup procedure should be performed to guarantee sufficient recoverability. These issues are discussed in detail later in this section. Blocks all activity on all data servers of the sharded cluster, and waits until all pending writes have been flushed to disk. Backups of the cluster’s data servers taken under Quiesce() represent a logical point in time. Resumes activity on the data servers after they are paused by Quiesce(). Creates a coordinated journal checkpoint and switches each data server to a new journal file, then returns the checkpoint number and the names of the precheckpoint journal files. The precheckpoint files are the last journal files on each data server that should be included in a restore; later journal files contain data that occurred after the logical point in time represented by the checkpoint. Freezes physical database writes, but not application activity, across the cluster, and then creates a coordinated journal checkpoint and switches each data server to a new journal file, returning the checkpoint number and the names of the precheckpoint journal files. The backups taken under ExternalFreeze() do not represent a logical point in time, but they include the precheckpoint journal files, thus enabling restore to the logical point in time represented by the checkpoint. Resumes disk writes after they are suspended by ExternalFreeze(). You can review the technical documentation of these calls in the InterSystems Class Reference. The steps involved in the three coordinated backup and restore approaches provided by the Sharding API are described in the following sections. Quiesces all database activity for a period of time. Data server backups should, in general, include not only database files but all files used by InterSystems IRIS, including the journal directories, write image journal, and installation data directory, as well as any needed external files. The locations of these files depend in part on how the cluster was deployed (see Deploying the Sharded Cluster); the measures required to include them in backups may have an impact on your choice of approach. The restore procedures described here assume that the data server being restored has no mirror failover partner available, and would be used with a mirrored data server only in a disaster recovery situation in which mirror recovery procedures (see Disaster Recovery Procedures in the “Mirroring” chapter of the High Availability Guide) are insufficient. If the data server being restored is part of a mirror, remove it from the mirror, complete the restore procedure described, and then rebuild it as described in Rebuilding a Mirror Member in the “Mirroring” chapter. Call Backup.ShardedCluster.Quiesce, which pauses activity on all data servers in the cluster (and thus all application activity) and waits until all pending writes have been flushed to disk. When this process is completed and the call returns, all databases and journal files across the cluster are at the same logical point in time. Create backups of all data servers in the cluster. Although the database backups are coordinated, they may include open transactions; when the data servers are restarted after being restored from backup, InterSystems IRIS recovery uses the journal files to restore transactional integrity by rolling back these back. When backups are complete, call Backup.ShardedCluster.Resume to restore normal data server operation. Resume() must be called within the same job that called Quiesce(). A failure return may indicate that the backup images taken under Quiesce() were not reliable and may need to be discarded. Verify that the only journal files present are those in the restored image from the time of the backup. This is critically important because at startup, recovery restores the journal files and rolls back any transactions that were open at the time of the backup. If journal data later than the time of the backup exists at startup, it could be restored and cause the data server to be inconsistent with the others. The data server is restored to the logical point in time at which database activity was quiesced. As an alternative to the first three steps in this procedure, you can gracefully shut down all data servers in the cluster, create cold backups, and restart the data servers. Create backups of the databases on all data servers in the cluster while the data servers are in operation and application activity continues. These backups may be taken at entirely different times using any method of your choice and at any intervals you choose. Call Backup.ShardedCluster.JournalCheckpoint() on a regular basis, preferably as a scheduled task. This method creates a coordinated journal checkpoint and returns the names of the last journal file to include in a restore on each data server in order to reach that checkpoint. Bear in mind that it is the time of the latest checkpoint and the availability of the precheckpoint journal files that dictate the logical point in time to which the data servers can be recovered, rather than the timing of the backups. Before switching journal files, JournalCheckpoint() briefly quiesces all data servers in the sharded cluster to ensure that the precheckpoint files all end at the same logical moment in time; as a result, application activity may be very briefly paused during execution of this method. Ensure that for each data server, you store a complete set of journal files from the time of its last backup to the time at which the most recent coordinated journal checkpoint was created, ending with the precheckpoint journal file, and that all of these files will remain available following a server failure (possibly by backing up the journal files regularly). The databases backups are not coordinated and may also include partial transactions, but when the data servers are restarted after being restored from backup, recovery uses the coordinated journal files to bring all databases to the same logical point in time and to restore transactional integrity. Following a failure, identify the latest checkpoint available as a common restore point for all data servers. This requires means that for each data server you have a database backup that preceding the checkpoint and all intervening journal files up to the precheckpoint journal file. This is critically important because at startup, recovery restores the journal files and rolls back any transactions that were open at the time of the backup. If journal files later than the precheckpoint journal file exist at startup, they could be restored and cause the data server to be inconsistent with the others. On each data server, restore the databases from the backup preceding the checkpoint, restoring journal files up to the checkpoint. Ensure that no journal data after that checkpoint is applied. The simplest way to ensure that is to check if the server has any later journal files, and if so move or delete them, and then delete the journal log. The data server is now restored to the logical point in time at which the coordinated journal checkpoint was created. Call Backup.ShardedCluster.ExternalFreeze(). This method freezes all activity on all data servers in the sharded cluster by suspending their write daemons; application activity continues, but updates are written to the journal files only and are not committed to disk. Before returning, the method creates a coordinated journal checkpoint and switches each data server to a new journal file, then returns the checkpoint number and the names of the precheckpoint journal files. At this point, the precheckpoint journal files represent a single logical point in time. Create backups of all data servers in the cluster. The databases backups are not coordinated and may also include partial transactions, but when restoring the data servers you will ensure that they are recovered to the journal checkpoint, bringing all databases to the same logical point in time and to restoring transactional integrity. By default, when the write daemons have been suspended by Backup.ShardedCluster.ExternalFreeze() for 10 minutes, application processes are blocked from making further updates (due to the risk that journal buffers may become full). However, this period can be extended using an optional argument to ExternalFreeze() if the backup process requires more time. When all backups are complete, call Backup.ShardedCluster.ExternalThaw() to resume the write daemons and restore normal data server operation. A failure return may indicate that the backup images taken under ExternalFreeze() were not reliable and may need to be discarded. Remove any journal files present in the restored image that are later than the precheckpoint journal file returned by ExternalFreeze(). If you are working with containerized InterSystems IRIS instances, see Upgrading When Manual Startup is Required in Running InterSystems Products in Containers for instructions for doing a manual recovery inside a container. The data server is restored to the logical point in time at which the coordinated journal checkpoint was created by the ExternalFreeze() method. This approach requires that the databases and journal files on each data server be located such that a single backup can include them both. This section describes the use of the %SYSTEM.Sharding API and the methods it includes. For more information about the API and instructions for calling the methods, see the %SYSTEM.Sharding class documentation in the InterSystems Class Reference. Enable an InterSystems IRIS instance to act as a shard master or shard server by calling the EnableSharding method. Define the set of shards belonging to a master namespace by making repeated calls to AssignShard in the master namespace, one call for each shard. Once shards have been assigned, verify that they are reachable and correctly configured by calling VerifyShards. If additional shards are assigned to a namespace that already contains sharded tables, and the new shards can't be reached for automatic verification during the calls to AssignShard, you can call ActivateNewShards to activate them once they are reachable. List all the shards assigned to a master namespace by calling ListShards. Rebalance existing sharded data across the cluster after adding shard data servers with $SYSTEM.Sharding.Rebalance() (see Add Shard Data Servers and Rebalance Data). Assign a data shard to a different shard namespace at a different address by calling ReassignShard. Remove a shard from the set belonging to a master namespace by calling DeassignShard. Set sharding configuration options by calling SetOption, and retrieve their current values by calling GetOption. Enables the current InterSystems IRIS instance to act as a shard master or shard server. Assigns a shard to a master namespace. Verifies that assigned shards are reachable and are correctly configured. Lists the shards assigned to a specified master namespace, to the console or current device. Activates shards that could not be activated by prior calls to AssignShard. Rebalances existing sharded data across the cluster after adding shard data servers. Reassigns a shard by assigning its shard number to a different shard namespace at a different address. Deassigns (unassigns) a shard from a master namespace to which it had previously been assigned. This removes the shard from the set of shards belonging to the master namespace. Sets a specified sharding configuration option to a specified value within the scope of a specified master namespace. Gets the value of a specified sharding configuration option within the scope of a specified master namespace. Displays a summary of the methods of %SYSTEM.Sharding. The package name IRIS.Shard is reserved for system-generated shard-local classnames and should not be used for user-defined classes. The schema name IRIS_Shard is reserved for system-generated shard-local table names and should not be used for user-defined tables. The prefixes IRIS.Shard., IS., and BfVY. are reserved for globals of shard-local tables, and in shard namespaces are mapped to the shard’s local databases. User-defined global names and global names for nonsharded tables should not begin with these prefixes. Using these prefixes for globals other than those of shard-local tables can result in unpredictable behavior. Transparent horizontal partitioning of database tables. Sharding provides horizontal performance scaling for queries and data ingestion. A database table that is horizontally partitioned, that is, divided by rows. Each shard of a sharded table contains a roughly equal subset of the table's rows, and each row is contained within exactly one shard. An InterSystems IRIS namespace that has been assigned one or more shards and can therefore contain sharded tables. A master namespace defines a sharded cluster, and is hosted by a shard master instance. A master namespace can also contain nonsharded tables, which can be joined to its sharded tables in queries, and in general has all the capabilities of a standard namespace. Any namespace (except a shard namespace) can become a master namespace by being assigned one or more shards. An assigned partition of a master namespace, hosted by a shard server instance. A shard is implemented as a shard namespace, which is transparent to end users of sharding. A data shard contains one horizontal partition of each sharded table in the master namespace; a query shard provides query access to the data shard it is assigned to. n.b. The term shard is also used to refer to a single horizontal partition of an individual sharded table. A set of InterSystems IRIS instances configured together to support sharding. A basic sharded cluster is comprised of one shard master data server on which the master namespace is defined, one or more shard servers each hosting one or more shards of the master namespace, and optionally one or more shard master app servers, across which applications can be load balanced. A sharded cluster is internally managed by the sharding manager. An InterSystems IRIS namespace that has been assigned to serve as a shard of a master namespace. Shard namespaces are transparent to end users of sharding. A namespace cannot be both a master namespace and a shard namespace. While shard namespaces are created in the same manner as standard namespaces, once assigned to a master namespace they are managed only by the sharding manager and never accessed directly by end users or used for any purpose other than as shards. The member or members of a sharded cluster to which sharded queries are directed. In a cluster without shard master app servers, the shard master data server is the shard master; when shard master app servers are configured, they are all shard masters. An InterSystems IRIS instance, or a mirrored pair of instances, on which one or more master namespaces are defined. Each master namespace defines a separate sharded cluster in which the shard master data server participates. In a sharded cluster without shard master app servers, the shard master data server is typically referred to simply as the shard master. Either term can be used to indicate the system hosting the InterSystems IRIS instance (or mirrored pair), rather than the instance itself. If any master namespace on a shard master data server is mirrored, all master namespaces on the instance must be mirrored. An InterSystems IRIS instance that is configured as an application server to a shard master data server. On the shard master app server, the default globals and routines databases of the master namespace on the shard master data server are configured as remote databases and a namespace is defined with these remote databases as its default globals and routines databases. An InterSystems IRIS instance which hosts one or more shards  data shards, query shards, or both. A shard server hosting only data shards is referred to as a shard data server, and one hosting only query shards as a shard query server, but the general term shard server can be used for either of these as well as for an instance hosting both shard types. Any of these terms may be used to indicate the system hosting the InterSystems IRIS instance (or mirrored pair), rather than the instance itself. A shard data server can be a mirrored shard server, but not a shard query server or a mixed shard server. All data shards on a mirrored shard server must be mirrored. A single shard server can host shards of multiple master namespaces, thereby participating in multiple sharded clusters. A shard that stores one horizontal partition of each sharded table in the master namespace to which the data shard is assigned. A data shard must be mirrored if it is hosted by a mirrored shard server. A shard that provides query access by ECP to the data on the data shard to which it is assigned. Query shards can be used to minimize interference between query and data ingestion workloads, and to increase the bandwidth of a sharded configuration for high volume multiuser query workloads. One or more of the query shards may be optionally assigned to each data shard in a sharded cluster. A query shard is never located on the same shard server as the data shard to which it is assigned. A query shard must have the same default globals database as its associated data shard; to enable this, the data shard’s globals database is configured as a remote database on the query shard. When SQL operations are executed on sharded tables, read-only queries are automatically executed on the query shards for all data shards that have them assigned, but directly on data shards that have no query shards assigned. If more than one query shard has been assigned to a data shard, queries are automatically load balanced among them. All write operations (insert, update, delete, and DDL operations) are automatically executed on data shards. A federated software component running on the shard master data server and each of the shard servers and shard master app servers in the sharded cluster, responsible for managing the master namespace and executing sharded operations. A query against one or more of the sharded tables contained in a master namespace that is executed in parallel across the shards hosted on the cluster’s shard servers. The individual partition of a sharded query distributed by the sharding manager to a shard. The query used by the sharding manager to assemble the results of the shard-local queries into a single result to be returned to the user in response to a sharded query. The field or fields in a sharded table used to horizontally partition the table, that is, to distribute its rows across a cluster’s data shards. A shard key can be either a system-assigned ID or a user-defined key. A query that joins sharded tables that have equivalent user-defined shard keys and are thus distributed across the data shards in an equivalent manner, and that specifies equal predicates for all fields of the shard key. Such a query can be performed locally on each data shard (or the query shards assigned to it), enhancing performance. Use of equivalent shard keys is therefore beneficial when frequent use of specific joins is anticipated. The shard key fields of all tables involved in a cosharded join must have the same number, order, and datatypes. A background job that runs on a shard server and executes commands against a given shard on behalf of a given application. A shard master data server configured as a mirror for high availability. On a mirrored master, the globals and routines databases of each master namespace must be mirrored. A shard master app server is never mirrored, since the sharded cluster’s shard master data server can optionally be mirrored. A shard server configured as a mirror for high availability. A mirrored shard server can host only data shards, and each data shard’s default globals database must be mirrored. A query shard is never mirrored, since the globals database of the data shard it is assigned to can optionally be mirrored.